In corporate America, specifically within the world of sales, there is a lot of schmoozing involved. This entails lunch meetings, after work drinks, dinners, and events. The great part about this is that it allows you to create and maintain mutually beneficial relationships where the client learns more about your company or brand, and you charge it all on a company credit card! If you are an entrepreneur, this is great because this charge will pose as a tax right off, so again, mutually beneficial for all parties involved. The question is where to take your clients? To solve this problem I reached out to my trusted friend and an amazing food blogger, Dominek Tubbs of Dom N’ The City. Dom is the connoisseur of food, drinks, and all things great, and as a Yelp Elite, Dominek has her finger on the pulse of those things that make a dining experience fun and memorable. She focuses on the things that matter to make dining experiences exceptional such as seasonal menus, attentive staff, food presentation, ambiance, and five-star review worthy dishes. It only made sense to reach out to Dominek for her expertise on this matter. 1. Baccarat Hotel - The hotel bar and restaurants located in Midtown Manhattan, make for some of the best locations for meetings, since the noise level is minimal. When conducting business both parties need to be able to communicate clearly and need to hear what is being shared. The better you can hear your client, the better your follow up email will be. 2. Zio- Located in the Flatiron district, this restaurant is one that Dominek and I have had lunch at before, and once I walked in, I quickly understood why she chose this place! This restaurant has some of the best Italian food NYC can offer, and their dining areas are divided into two sections. The large dining area in the back is perfect as the tables have an adequate amount of space between them, so eavesdropping is not an issue. When conducting business, it is important that privacy is taken into consideration in order to prevent personal business info being leaked out to guests at neighboring tables. 3. Society Cafe - At times, you may find a client who is an early bird and does not mind having a breakfast meeting. For someone like that, this cafe located in Greenwich Village, is perfect for them! Society Cafe is open every morning at 6:30 am and serve in Dominek’s opinion, an incredible breakfast. Since Dom is a Yelp Eliter, I believe her; she has never steered me to a bad restaurant or bar. 4. 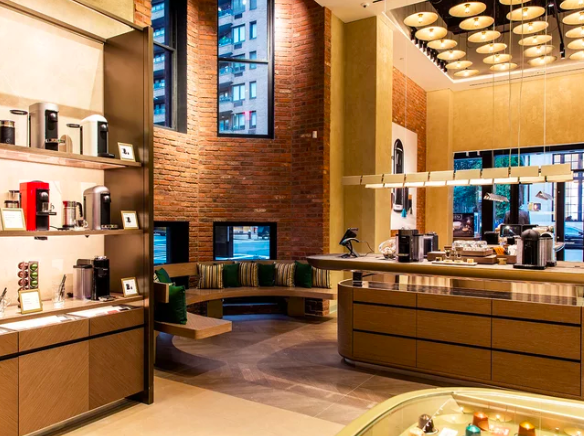 Nespresso Boutique - Some clients may need to kick off their day with coffee and conversations. If that is the case, taking them to this affordably priced cafe located in SoHo and the Upper East Side of Manhattan, will help cure their caffeine fix. With this type of common meeting, one thing is for sure, you will know for sure that your client is awake and alert! 5. The River Cafe - If you are truly trying to impress a client, then taking them to The River Cafe will definitely do the trick. This Brooklyn based restaurant lies in the DUMBO section of Brooklyn overlooking the Statue of Liberty and the breathtaking views of the NYC skyline. According to Dominek, the food is great tasting with superb presentation, which also means it is a bit pricey. I have been to this restaurant to indulge in a nightcap, so I must say if the drinks are good, I definitely believe the food must be as well. 6. ABC Kitchen - With two locations in Manhattan and one in Brooklyn, the ABC Kitchen has such a diverse menu there is literally something for everyone! This restaurant is a great client meeting spot for both lunch or dinner. It is very bright, welcoming and helps boosts your mood since it has such a beautiful ambiance. Taking your clients here is a plus! The restaurants and cafes listed above are just the very few that Dominek would suggest around the city, but of course, there are many more! To check out more in NYC or other cities, visit www.domnthecity.com then go on her Yelp page and bookmark the places she suggests! Happy Meeting, Dining & Schmoozing!